Most people think of Sapphires as being blue, and this is certainly the most commonly seen colour. But they’re also found in shades ranging from the gold of a sunrise to the luminous violet of a twilight or the deep indigo of a summer evening. Colours other than blue include grey, pink, orange, yellow, green, brown, clear and parti (a mix of greens, golds and blues). The highly prized blue is a lustrous cornflower shade, with a hint of violet, which in artificial light can appear ink-coloured or black-blue. Gemstones in lighter or darker blue can usually be obtained more cheaply. Apart from colour, size, transparency, purity and cut are factors that determine a Sapphire’s value. The finest sapphires are free of secondary colours or nuances that diminish its beauty. Sapphire is the gem quality variety of the mineral corundum (aluminium oxide), which is also the source of rubies. The colour of the blue sapphire is formed from iron and titanium, while in violet gemstones it’s from vanadium. The origin of ‘Sapphire’ is uncertain, but probably comes from the Greek word ‘sappheiros’ – meaning ‘blue stone’ – which derives from the name of the island of Sappherine in the Arabian Sea. This island was source of Lapis Lazuli in ancient times, and Lapis was called Sapphire until the end of the medieval period when the difference between Lapis and Sapphire began to be properly understood. It is believed that Sapphire was first mined in Sri Lanka, in ancient times. In such times, the Persians believed the sky was the reflection of a massive blue sapphire in which the Earth was embedded. Its heavenly blue thus signified the utmost of celestial hope and faith, and was believed to bring protection, good fortune and spiritual insight. It was also a symbol of strength and power, and of kindness and wise judgement. It was also thought that the Sapphire produced a purity of the soul. Thus, during the medieval period, priests wore sapphires around their necks as protection from unpleasant thoughts, while rulers wore them as protection from harm and envy. 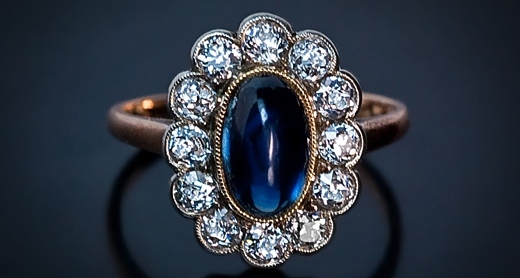 The French believed the Sapphire was productive of wisdom, and transformed bad moods to good. Lovers gave their partners a Sapphire to wear to ensure their faithfulness, and the colour of the gemstone was believed to darken if worn by a lover who was untrue. Today Sapphire is still considered a gemstone of wisdom, of learning, of clear thought, and an aid to the seeker of deeper spiritual truths. Its pure blue emanations are believed to bring order and healing to the mind, provide strength and focus, and an ability to see beyond surface appearances to reveal underlying truths. Sapphire is believed to permit a greater depth of consciousness that allows a fuller understanding of the inner self. It’s associated with the planet Saturn, and because it enhances order and self-discipline, it’s thought to assist in the accomplishment of goals and the rational presentation of ideas. Sapphires are predominantly found in Australia, Cambodia, Kashmir, Madagascar, Myanmar, Sri Lanka Tanzania, and Thailand, where they’re obtained from alluvial deposits or those formed by weathering. Being a hard gemstone, Sapphire can be placed in most settings, but it has a brittleness that means it needs careful handling, and can develop internal flaws and cracks if dropped on a hard surface or receives a sharp blow. Please click here to browse our collection of jewellery available online..